These Snow Dome Ornament designs are some of the latest additions to the KDS site and we are celebrating the twelve days of Christmas by doing a give-a-way! It is so easy to enter this giveaway. To be eligible to win, just post a comment on the blog about how much you’d like to win these charts! Be sure to include your email so we can contact you if you are a winner. The winners (three will be selected using random.org) will be chosen on December 24 – Christmas Eve – so you will have your Dome designs to stitch for Christmas 2012. Help us spread the word – share about the giveaway on Twitter and Facebook too with a link to our blog! If you do so, post an extra comment to let us know about it for an additional entry into the giveaway. Check out the Snow Dome Ornaments. This entry was posted in Main by Connie Barwick. Bookmark the permalink. These are so beautiful.please enter me for a chance to win these snowflakes. I absolutely love any/all Christmas designs… I work on them all year long. Can’t remember stitching anything that didn’t didn’t pertain to Christmas, as it’s been that long. Those are so super cute! I would love to win them! I LOVE LOVE LOVE Snow globes! Never thunk about stitching one. Would love to win these charts! Shared it on the facebook too! These really are adorable. I especially love the bright colours and the festive designs! I’d love to share them with my 3 daughters — the oldest already knows how to cross-stitch, and the other 2 are quite eager to learn. These are very cute! I’d love to stitch one up! The one with the moose is super cute! I like the designs, those would be cute to stitch into on quilt blocks. 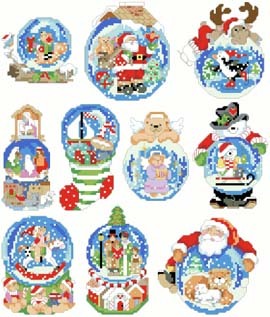 I would love to win these Snow Globe charts and have time to stitch them as gifts all through the year, to be ready for next Christmas! I posted about this giveaway on my Facebook page, Deborah Faris Bryant. Those are adorable! Thanks for the chance to win! These are adorable, & oh so tempting! Sooo cute! they would make a wonderful addition to my decorations!! I love these designs and especially love to stitch Christmas ornaments all year long to help keep me in the spirit all year. I really like KD too! the snow globes are awesome! I think the moose is my favorite. Would love to win. I would love to add these to my tree, they are so pretty. I really like those! I used to collect snow globes. What a great way to have them back and yet not worry about them breaking. I thnik that these are fantastic, I really would love to win these. I would love to win these! They would make such nice ornaments or a christmas quilt! Love, love, love! I absolutely love snow globes! These are great looking ornaments. Thanks for the giveaway. I would love to win. I just love the snowglobes. I would love to win these. Holy snows! My gramma collected snowglobes! Would love to win! Cute! Who doesn’t love snowglobes?!? I love these designs. They are so colorful and original. Please enter me in your generous giveaway. These are adorable! I’d love to win this. I would love to make these. Please enter me into the drawing. I hope I win! I shared this page on Twitter! I shared thispage on Facebook too! These globe ornaments are adorable and they look like fun to stitch. Please include me in your giveaway. Thanks!! I would love to win the charts. My son has always loved snow globes and it would be great to make some for next Christmas as a surprise. I just love Christmas and your designs, and these snow domes are beautiful. Please enter me into your Giveaway. I collect snowglobes and absolutely adore the cross stitch snowglobe designs. It would be wonderful to be picked as a winner of these adorable designs – they would look great on my Xmas tree next year! I would love to enter for these beautiful designs – they will be wonderful for ornaments next Christmas!! I have never seen those Xmas ornaments! They are really gorgeous! They really make us happy!! Thanks for giving us the opportunity to enter in your giveaway! Very nice and generous of you!!! Your snow globes are so original and adorable. They make me smile! Thank you for being so generous in offering a give away. If I am lucky enough to win, they will be stitched with love. Merry Christmas! I would love to win a snowdome, they look absolutely GORGEOUS! !